Toddlers love activity and the chance to practice their growing language skills. 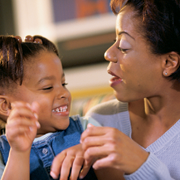 You can use these traits to advance your toddler's pre-reading skills. Involve toddlers in the reading experience by asking them questions and having them expand on the stories you read to them. Toddlers who talk about the illustrations, characters, setting, actions and other aspects of books step up the development of their reading skills. The West Bloomfield Township Public Library has a great assortment of board books and picture books for toddlers. We have also created a reading list a list perfect for young children, the list provides an impeccable assortment of picture books, board books, nursery rhymes and easy to read, colorful books perfect for your toddler. Visit the library for the 75 books to read to the very young list as well as a nursery rhyme booklet to use at home.